Here we have compiled everything you need to know to get started with Google Analytics in general, and specifically with its Version 5. Unarguably one of the most powerful web analytics applications available in today’s time. 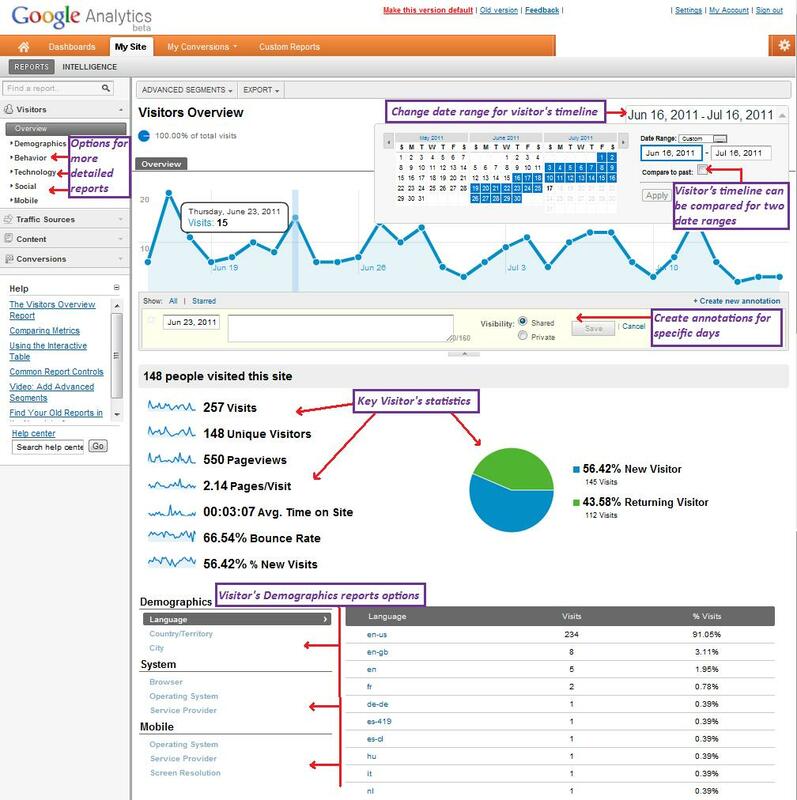 Whatsmore Google Analytics (GA) is entirely free program, and this makes it even more appealing. GA Version 5 – What’s new? There have been some fairly significant user interface changes. GA (v5) has been revamped and made much more focused, clean and systematic. Various reports have been organized in a sleek manner under different categories and sub-categories. This categorisation ensures that even a novice can gain tremendous benefit from the various features GA offers. Each area like visitors, content etc have been covered in more detailed manner and the parameters used to decipher them have been enhanced for more useful information. New GA (v5) is considerably easier to understand as certain parameters are stacked against each other like Frequency & Recency, new v/s returning visitors; which allows the user to get real useful information from the data. Also the help section has been improved and been made much more detailed and inclusive. 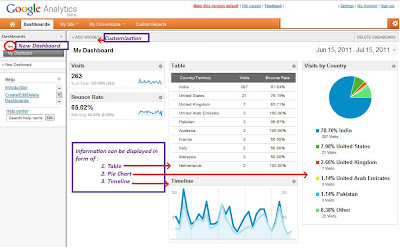 New Features in Google Analytics v5? 1. 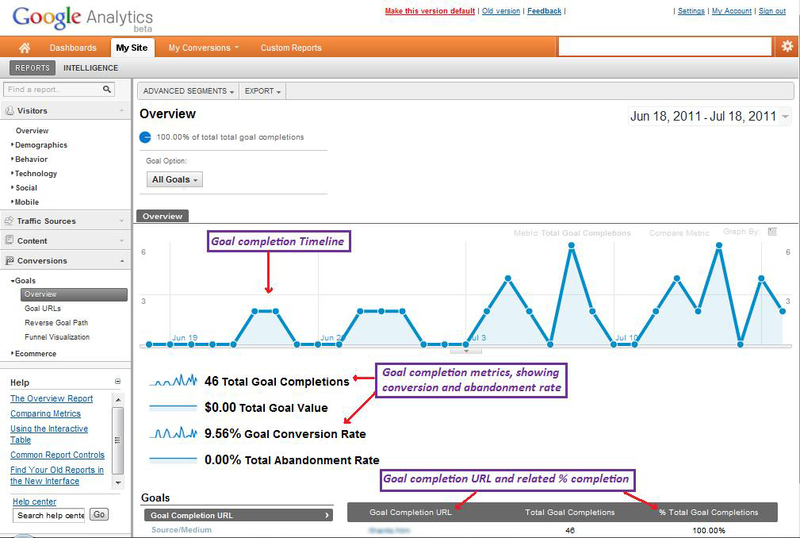 Custom dashboard: Most prominent new features in Analytics version 5 is the addition of custom dashboards. a. As the name suggests you can customize your own dashboard to include whatever metrics you are interested in. b. The customization goes even further as GA allows you the option of having the information displayed in: Table/Pie Chart/Timeline format. c. Once you have chosen your metrics you can even move them around on your dashboard, and position them as and where you would like to place them. 2. Intelligence: In GA v4 Intelligence was introduced and was operating in the beta version, GA v5 has incorporated Intelligence as a Primary feature and it’s now a permanent and integrated part of the GA functionality. 3. Basic Interface: GA v5 in the new jazzed up version has seen many subtle changes in its basic interface. These changes have made the entire GA experience smoother and delightful. Let’s check out how Google has improvised the basic interface for GA v5. Newer GA has been created from user experience and this clearly shows in 1st page you are brought to once you access your reports for your website/blog. After you log into GA v5 when you access the report for your site/blog; the page that greets you is – ‘Visitors Overview screen’. This screen has overview of visitor’s data; and assimilates all the visitor information that you would like to look at right away. 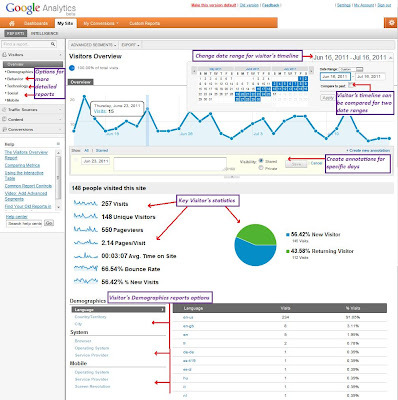 In GA v4 you were first brought to the Dashboard featuring an overview of your website/blog; displaying data about visitor’s overview, traffic overview, site usage etc. While the dashboard felt more comprehensive it looked a tad confusing with all information jumbled up together. Every report has a standard format with a timeline showing the traffic patterns for the past month (by default). You can use the drop down menu to change the date for this timeline in any report. Also you can choose to compare the timeline for two date ranges. The timeline has inbuilt feature for annotations, this feature was present in GA v4 and has been carried forward in GA v5 as well. Annotations are extremely useful for noting down information regarding sudden change in the timeline. For example you may have noticed sudden increase in traffic on a day that you began a new ad campaign, you can make an annotation for this sudden spike in traffic (about reason for the spike: new ad campaign); for future reference. Along the left-hand side of the screen is the main report navigation panel. 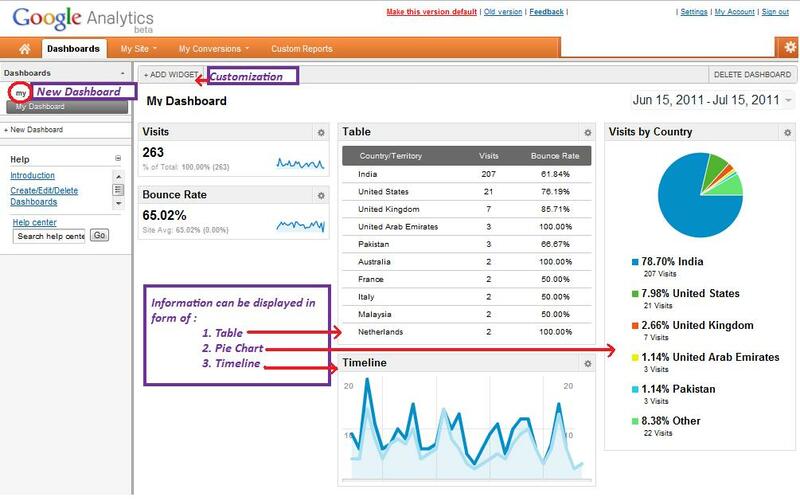 You can view more detailed reports for Visitors/ Traffic Sources/ Content/ Conversions menu from this panel. Along the top of every page you can see two more navigation panels. Top most panel is the main panel and it has tabs for Dashboard/ My conversions/ My site & custom report. The panel under it has tabs for Reports & intelligence. Reports is the tab you will be referring to when viewing your reports under various headings. While the intelligence tab is a new primary addition and will be discussed later. The visitor’s overview is the default screen in GA v5 when you wish to view the report for any of your sites/blog. This screen gives you the number of visitors, visits and unique visitors. It also provides page information in form of pageviews, pages/visit. Data is also provided about other parameters; namely average time on site, bounce rate, and the percentage of new visits. 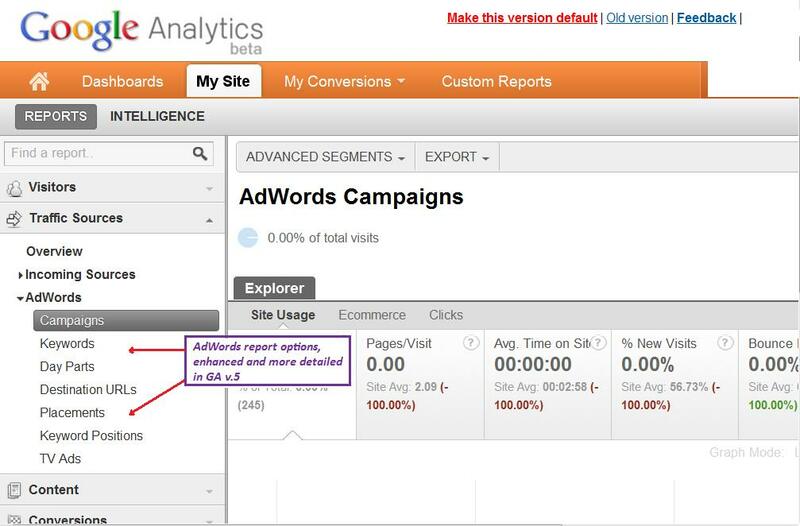 This screen also includes a pie chart comparing new to returning visitors. The screen also includes a table showing the language break up for the visitors. Last but not the least, the overview contains a menu listing the various heads for which you can view the data in table format. This overview is well structured and provides you with excellent insight into the performance of your site & a general idea of visitor’s behaviour on your site. 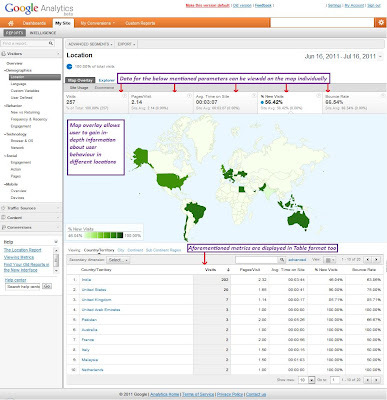 Map overlay can be looked up in further detail by clicking on any country. This will get you a larger map of that country, with more detailed information about where your visitors are coming from. 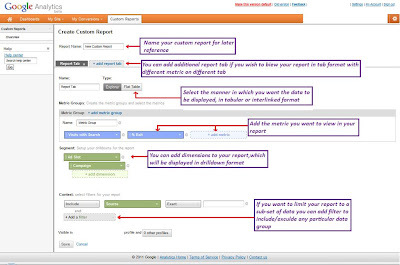 Options to set up user defined and custom variables are useful tools for those seeking to get more thorough report from GA v5. Now that you have seen the visitor’s data, the next area is all about understanding the visitor’s behaviour. This section give reports on the breakup of visitors into new vs. returning, the frequency & recency of the visits and most importantly the visitor engagement metrics. New vs. Returning visitors allows you to know how many new visitors you are attracting; a good balance between the two types of visitors is best shot for any website. Frequency & recency of the visitors allows you to gauge how many fans your website has. The higher the frequency & better the recency the more loyal fans your website has attracted. These fans go a long way when you are looking to set up revenue generation from your website. The engagement report is one of the most crucial reports to understand your visitors psyche. 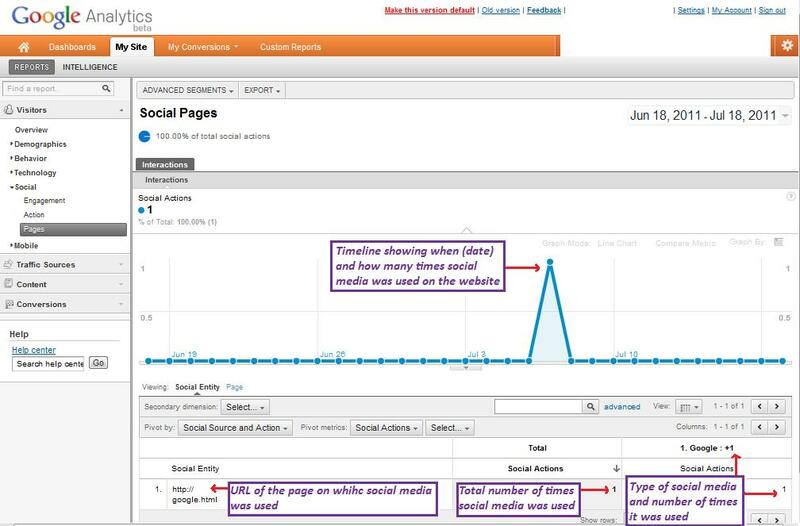 This report shows two key metrics: the visit duration and the page depth i.e. how many pages a visitor viewed. Longer the duration and higher the page depth the better visitors engagement you are achieving. There are two technical reports in the visitors section these deal with technology and mobile. In GA4 the browser & network details were scattered all over the place, in GA5 these details have been systematically arranged under two sub-categories of Technology and Mobile. Technology covers the Browser & OS and Network details. This data is quite useful when designing the site, as you can ensure that your website is optimally designed and structured for the OS & Browser majority of your visitors are using. The technology report is also crucial when you are planning to redesign your site, in case you have a significant percentage of visitors coming to your site using older technology, you will have to rethink your redesigning plans to ensure that your visitors are not inconvenienced. Mobile sub-category has been made more detailed with metrics like mobile input selector, which brings to you the data about the type of mobile input your visitors are using: touch screen/ keypad etc. If a sizable number of your visitors are accessing your website via mobile then this is quite useful metric as you can configure your site to make it technically and aesthetically more pleasing to the mobile users. If need be you can decide to design a special mobile version of your site specifically for your mobile visitors. Mobile sub-category also offers report on the Visitors Mobile device brand. This information is useful in technical terms for website designing as well as for gauzing your visitor profile too. Generally mobile brand users have a well-defined demographic are/ income/ interest wise. You can use this information to design your website accordingly and make it more interesting to your visitors. This is the latest addition to GA and its right on time .Wit the introduction of Google +1 button GA has also gone social. This new feature in GA is meant for monitoring the social engagement and usage of your website and your visitor’s social involvement. 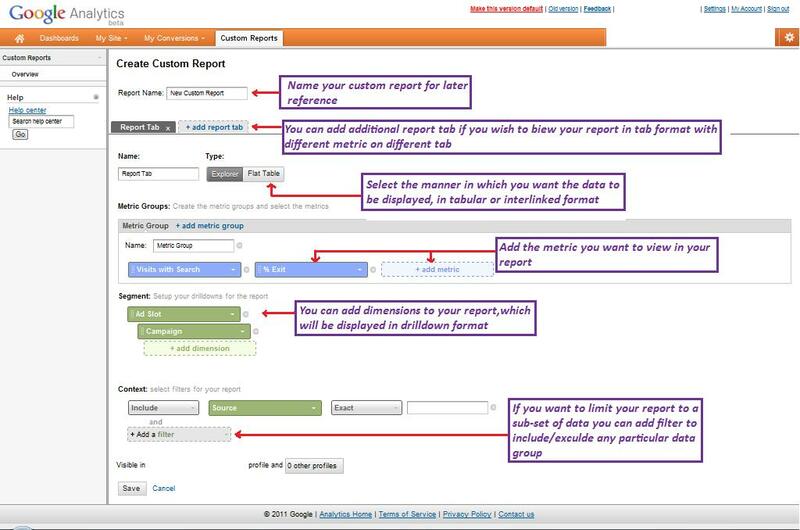 This section is has 3 types of report, engagement, action and pages. Social reports are automatically activated for Google +1 button. If your website/blog supports other social media button as well, you need to follow GA help guidelines as to how you can get the Social metrics activated for the other social media channels like Facebook like, Twitter share etc. Engagement report speaks about how many people use the social media button on your website button. As mentioned before this and all other social reports are activated by default for Google +1. Last but not the least in this section is the Pages report. This report provides in-depth information about the use of social media on your website. This report focuses on which pages of your website were shared using social media. Also covered is the data regarding when the page was shared, how many times and which social media was used to share the page. Traffic sources are a very crucial part of the GA reports. This report is all about gaining a better understanding of both incoming and outgoing traffic from your website. This screen provides a timeline showing the flow of traffic to your website over the time period selected. This is followed by a pie chart showing the various sources that sent your visitors. Below this is a small menu which provides you with various options to see more detailed information about traffic sources. Finally this report includes a table which lists the keywords used by visitors to get to your website and the % share of each of these keywords. This segment covers various reports pertaining to the incoming traffic for your website. It contains reports about All traffic, Direct traffic, Referrals, Search traffic, and campaigns. 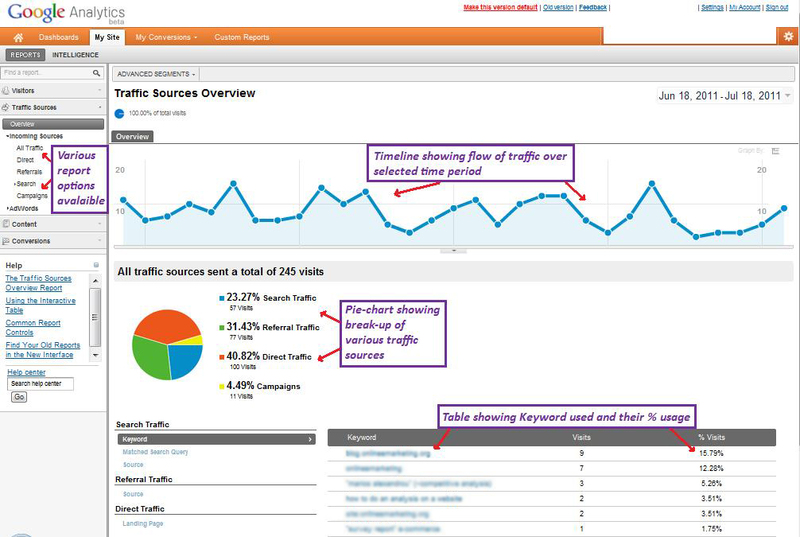 All traffic report contains data about the entire incoming traffic for your website. In GA5 this report has been enhanced to include more metrics in form of; page/visit, average time on site, bounce rate etc. These metrics are a huge boost as they aid in making a more informed and relevant decision from the data contained in this report. Next up is the Direct traffic report. In GA 5 this too has been further detailed to include additional information in form of landing pages for the direct traffic. This is a very useful addition as by viewing this report you can make out which page of your website is acting as the best landing page and could be brought into prominence. At the same time, the pages that are not as successful as landing page, can be tweaked to improve their success rate and attract more visitors. Referrals report has also been expanded to include a new metric. In GA5 this report has new addition in form of information of the landing page where the visitors form referrals come to. This metric is very helpful in understanding which page is most used by referral sites; and also to know that which page is acting as the opening of the funnel for these visitors. Search traffic report this too has been done more thoroughly in GA5. The report has been differentiated into organic/ paid/ campaign traffic. 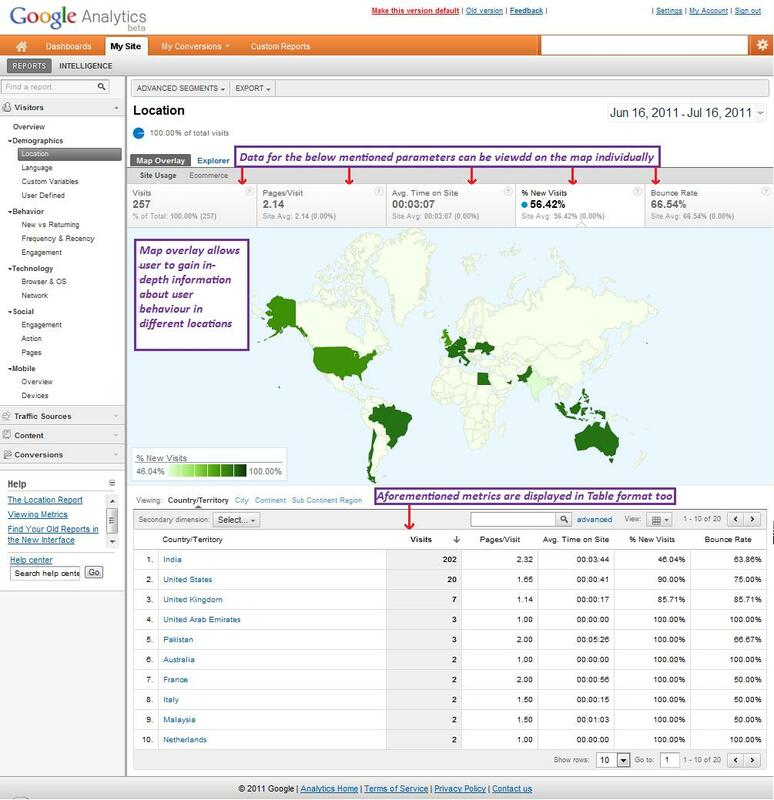 This report also tells you which page visitors are landing on most often, and which search engine they’re coming from. 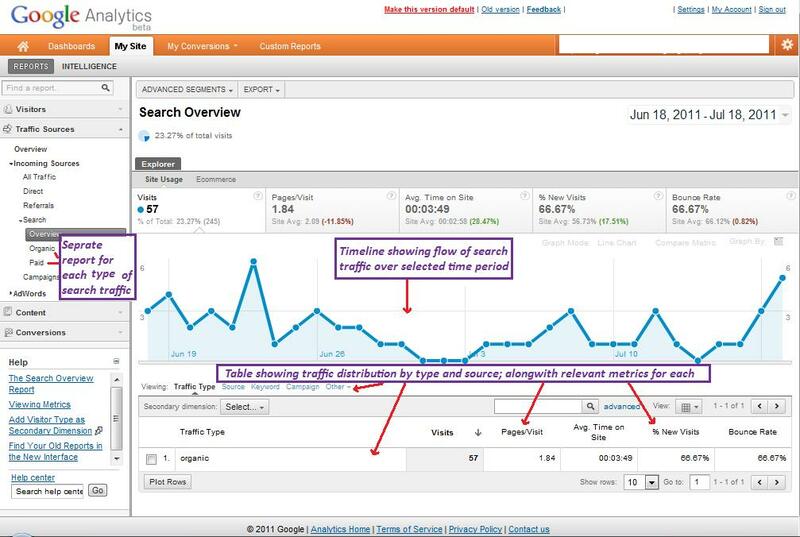 You can view your paid (AdWords) traffic and organic traffic, or a mix of the two. o Organic traffic – has details like source of the traffic, landing page for these visitors, and also the keywords used by these organic visitors to reach your website. o Paid – Has details like keywords used, source, medium, campaign etc…. Campaign report, this shows details of traffic from your unpaid campaign. In case of blog, this will show traffic coming from the RSS feeds. This report has filters for, the source and medium of the traffic…. online feed campaign…. with details for it, like Page/Visit, Average time on site, Bounce rate, etc…. Incoming Source report is very meticulously planned and it’s very handy to figure out the weakness present in your website. An ideal situation would be having a mix of traffic from all different sources to ensure that no one source is overwhelming. E.g. In case majority of your traffic is organic, then when Google goes about changing its search algorithm (panda update) your website is likely to get hit tremendously. So maintaining a healthy incoming traffic source balance is crucial for your websites traffic heath. This section has again been infused with more metrics. 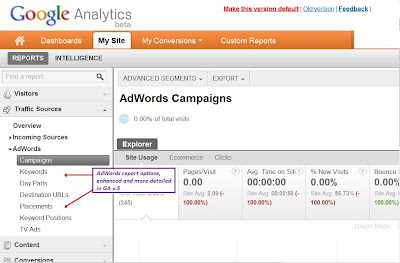 If you use AdWords for your website/blog then this section will be a lifesaver for you. In this section you can view detailed reports for traffic driven by your ads, including campaigns, keywords, day parts, destination URLs, placements, keyword positions, and TV ads. A new addition in this segment is Day Parts report. This is an invaluable report as it tracks your AdWord Ad’s 24*7 and displays data about – the AdWords traffic to your site during each hour of the day and day of the week. This report is very useful to plan your AdWord campaign as you can get complete information on when your AdWords traffic peaks, the relevant time and days. This way you can save a lot of investment by timing your ad’s to maximize their potential. Destination URL report is another new addition. If you are running simultaneously more than 1 AdWords campaign then this report is the thing for you. This report shows the success of the various landing pages (URL) you are directing your customer to. Using this report you can see which URL is being most effective and adjust the other URL’s and your AdWords campaign accordingly. The Placement report is a handy tool to mange and compare the placement of your Ads on Google AdWords. This report offers details like various domains and specific URL on which ad are placed to get better idea of which domain is performing best and the other related parameters. Overall these reports cover the number of visits generated, pages/visit, average time spent on the site, percentage of new visits, bounce rat. Of economic importance are two metrics namely; total goal completions, and the revenue generated. These two metric help you make sure that the ads are generating enough revenue or conversions to make them worthwhile. This page opens with a timeline of the pageviews for the selected time period. Below this graph there are a number of data mentioned like: Pageviews, Unique pageviews, Average time spent on page, Bounce rate, AdSense revenue, AdSense page impressions etc. The most prominent data here is unique pageview, which will draw a true picture of the number of times your website page were actually visited. AdSense data on this page is helpful in evaluating the success of your AdSense program. At the bottom of the overview page you’ll see a small menu presenting options to review your site content by page or page title, to view your site search, to view your events, and to view AdSense earnings by page. This report is divided further into many more parts like pages, content drill down, landing page etc. These part reports were present in GA 4 as well but GA5 sees the reports organized in a very systematic manner. Special attention should be given to the landing and exit pages report as these will help you understand what funnel your visitors are following, and which part of the sales funnel is leaking out maximum visitors. The landing pages should be looked up for being pumped up with more information and engaging content; whereas the exit pages should be looked up to be made more engaging and interesting. Site speed is a technical issue but a very crucial one. This report should be checked from time to time to make sure that slow speed isn’t dragging your website behind. Slow pages can be a great deterrent to your visitors and they are also likely to affect the revenue generation from your website. This report allows you to check out the speed of every individual URL of your site. This is a great way to find if any particular page is playing the black sheep and redesign it accordingly to get it in line with the rest of your website. This is another exciting report which GA offers. This report focuses on gathering data related to how visitors searched within your site. 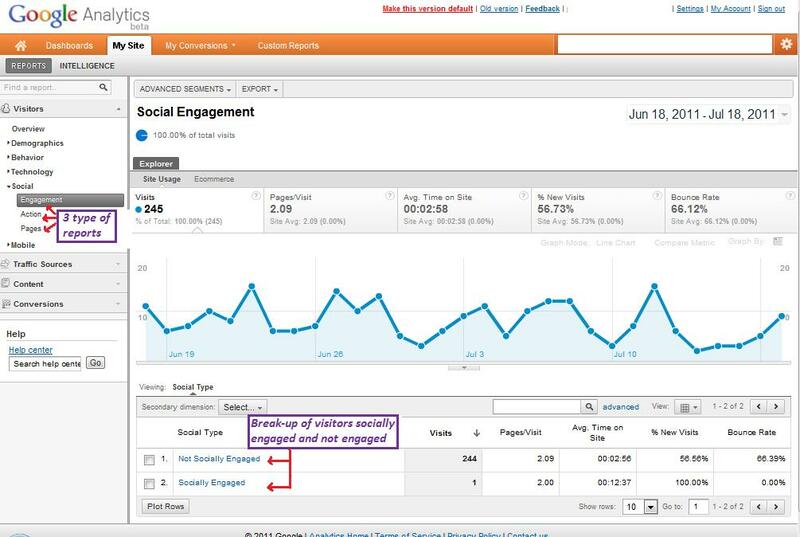 It incorporates various metrics to help you measure, compare and understand how visitors are navigating your website. 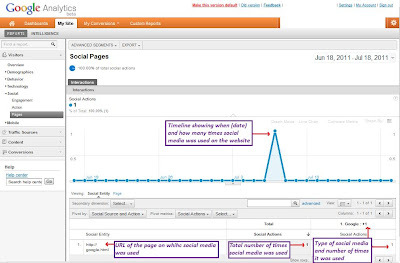 This report includes 4 features in form of overview, usage, search terms, and pages. Site search a very useful feature to understand how your visitors search your website, which pages get most views, and most importantly what keywords do visitors use while searching your website internally. Site Search is not automatically activated in GA since there are privacy concerns about the data GA gathers by monitoring a site’s internal search usage pattern. For each website/blog that you want to use this feature you need to manually activate it. 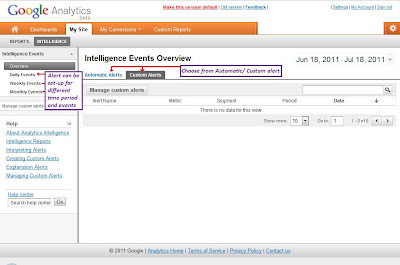 Events is a nifty tool, if you have certain particular area/ items in your website that you want to monitor. This feature allows you to program an event into your site’s code and then GA tracks it for you. This tool is great for Flash websites which have can set-up events to track the number of pageviews their website gets. Any event is defined by 5 parameters, as under. Of these two parameters are compulsory, the third is an optional attribute and you may/may not choose to define it. If you are using AdSense on your website/blog then this tool is made for you. 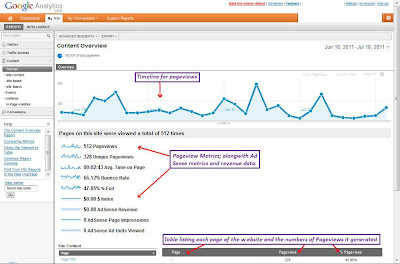 This report has 3 parts namely: overview/ AdSense Pages and AdSense referrers. The overview provides an once-over of all the key metric for your site. A timeline displays the daily total AdSense revenue for your site. Under this are mentioned the key metrics and a table displaying some key values. Additionally the AdSense Pages and Referrers help you have a more thorough insight into how, what, where, and why of your entire AdSense programme allowing you to monitor and run it better and smoother. This quirky feature was in beta version in GA 4. GA 5 sees it being fully integrated and being included as a primary feature. This feature can best be described as an ‘On-site inspection tool’. In-Page Analytics report lets you see how users interact with your web pages. For each link, you can see the percentage of total clicks that occurred on that link, along with the percentages of transactions, revenue, and goal values for which that link was responsible. It’s a neat tool and a very useful one to analyse your website in detail. Conversions are as the name suggest all about how, when, where and why of your visitors conversion behaviour. This tool is a boon if you are using your website for Ecommerce. Conversions is broken down into two categories namely: Goals and Ecommerce. Goal is exactly what it means it’s the final destination you want to reach. 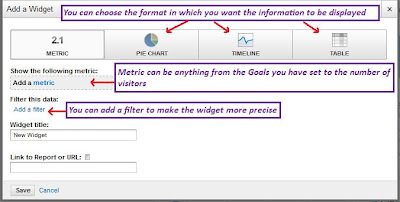 Goal can be where your customer/visitor to reach to when visiting your website. It can be anything from a ‘Confirmation page for purchase made’ to a ‘Thank you for showing interest; we will get in touch soon’. 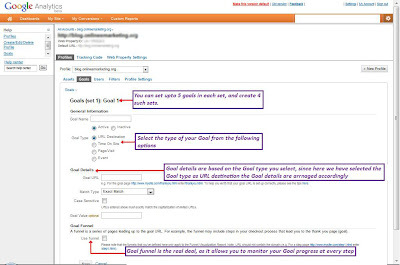 Goal can also be set up for a length of time spent on your site, the number of pages/visit, or an event. In this way the goals help you in monitoring how well is the website fulfilling its business objective. Setting these goals and using the Goals tool at GA helps you in making sure you reach them, as you can set the entire path you want the customer to take to reach your goal. Once you have set the path (known as funnel) then GA monitors this path for you and can provide you requisite data about the entire path so you can know where is the point where your visitors not reaching the goal go astray. 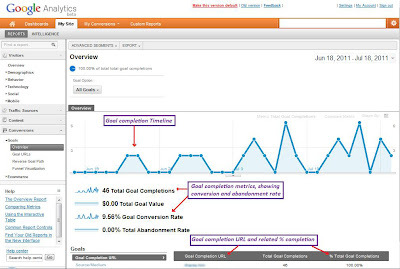 This tool comes with many useful reports like; goal overview, reverse goal path and funnel visualization, and goal URL. Reverse Goal path is a new addition and is very useful to understand what path users are taking to reach your goal page, and which path is proving to be most successful. At a time you can set up to four sets of goals. Each set can have up to 5 individual goals. You need to select a goal name, followed by the Goal type. 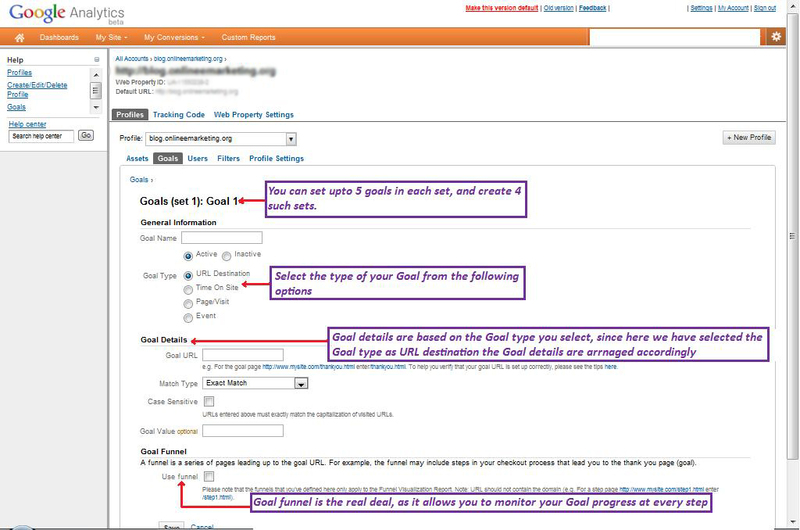 Then you need to enter the goal details based on the type of goal you are aiming to set. 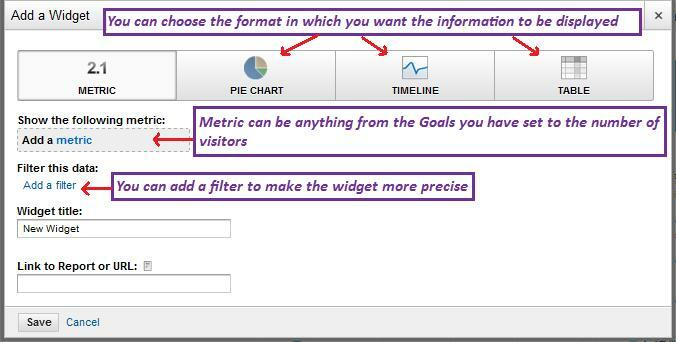 Finally if you are really detailed person you can also set up a funnel (a series of URL/ steps to reach your goal) leading up to your goal page. Funnels make the entire Goal experience much more enriched and useful as they allow check-point monitoring. Another new addition to GA is E-commerce. This feature is new and a tad complicated to set-up as it requires certain technical handling. However if your website is being used for E-commerce you got to have this feature going for you. Ecommerce covers many useful metric in form of key conversion, transaction, revenue, and purchase metrics for your site. All these metrics can be compared and studied in detail to draw more useful conclusions. GA takes the cake with its custom reports. There are reports and then there are custom reports. It’s like having your own personalized newspaper everyday/week/month; as you choose it to be. These reports have ample filters and lots of options. Custom reports means really custom, you even get to choose the way information is displayed in timeline/chart/table format. Here’s another beta coming on age and just in time too. Welcome the most intelligent feature of GA 5 the ‘Intelligence’. This feature too had debuted in GA 4 in beta version; GA 5 sees complete integration of this as a primary feature. Intelligence monitor’s your websites traffic to detect significant statistical variations; and then it automatically generates alerts about those variations for you to notice and analyze. Intelligence is a great tool to monitor anomalies. It’s like a virtual assistant to you, which will monitor your website 24*7 for you and keep your abreast with the latest happenings. And if anything were to go beyond normal it will immediately note the anomaly and alert you to the same. You can set up the alert as automatic or custom. 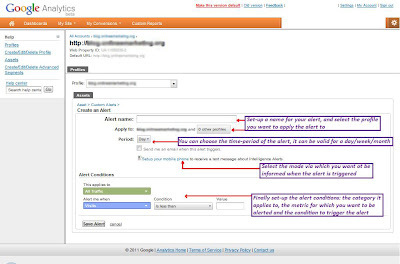 In case of automatic the alerts are generated is there are any significant changes in the key metric for your website as compared to the historical records for the same metrics. For example is historically the average visitor for your website are 1000 per day then if suddenly the visitor level drops down to 500 or increases to 1500 the automatic alert of intelligence will be triggered; and you will be updated immediately. 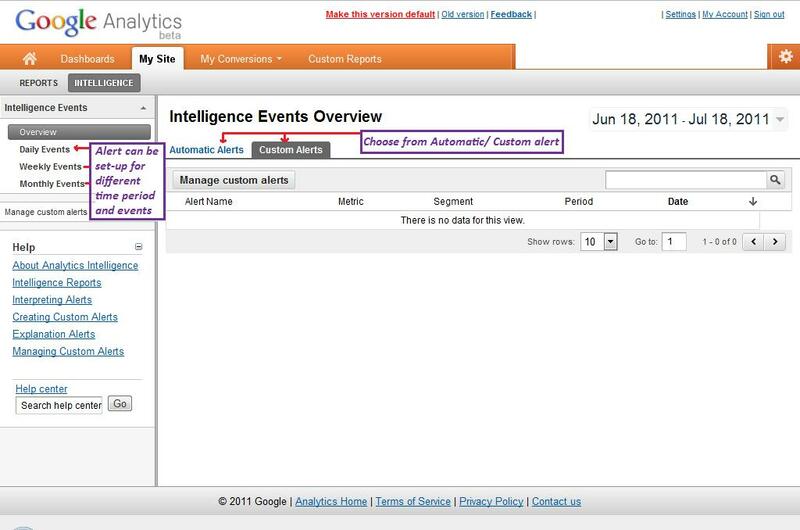 The other option you can choose is Custom alerts. These alerts can be set-up, for anything you define. 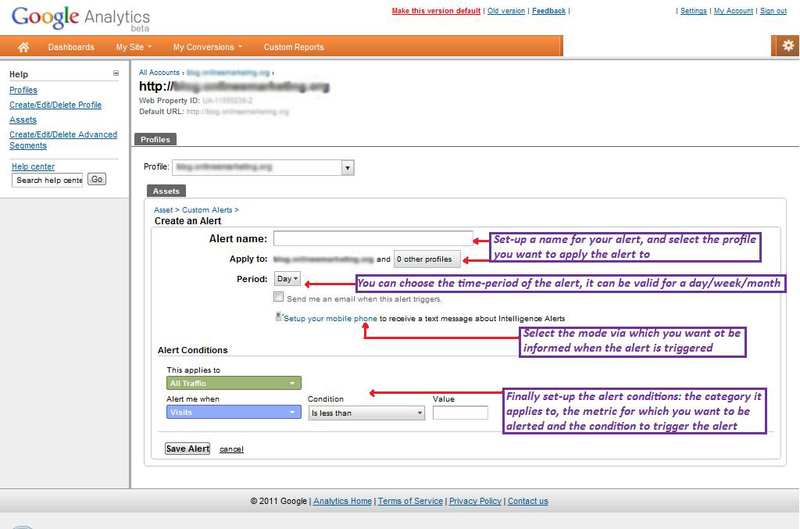 You can configure these alerts for specific conditions as per your discretion. For example you may want to set-up a custom alert for more than 5% decrease in organic traffic. If this alert is triggered, GA will immediately notify you via your chosen means of communication i.e. Email/ Mobile/ both. GA intelligence is an extremely powerful tool to track your website and keep abreast with any sudden changes in it; and react to them faster and better. This will ensure your website remains in top condition and your visitors are kept happy and contended. Overall, the biggest changes are in the interface layout, rather than the functionality of the program. Thanks for sharing such a nice post on Learn Google Analytics; article is good, thats why i have read it entirely.